OOOOH another Textured Slab Pot! Got another glaze load out of the kiln today. Finally getting some consistent results from the adjustments I made on the L&L. This is one of the pots I made using the textured paper. To get the inside pink and outside blue, I protected the "binding" with wax resist and glazed the inside with the pink, re bisque the piece and then glazed the outside. The glaze at bisque temp crackled quite a bit when I took it out of the kiln, but enabled me to clean off the blue glaze that got on the inside of the pot easily. After refiring, the crackling repaired itself. I am really pleased how much detail shows with this paper. The yellow eyelet pot detail was very faint, comparatively. Off to Hickory tomorrow to set up for the Festival. I seem to have collected plenty of pots, this one included. Hopefully everyone can read this as I made some changes and now I can't get to my page!! Well the show is coming up this and I will be bringing quite a variety of my work, since I haven't had any time to make a stock of production best sellers. Hope those of you that can will come by. I kind of doubt that I will be doing the show next year. The Stucco Guys finished the cement work and will be back in a few days to paint... just in time to get my things for the show out of the garage door before they come back. Ilse packed up 3 orders yesterday and a big one, (6 18" boxes! ), today. I started working on the large order for Mast Store, at last. At least I got started on it before I have to stop to get ready for and do the show. Never a dull or still moment here! These tea bowls were a challenge to the thrower, seen at the right, to throw as many as he could in 5 minutes. He did 18. Very doable off the hump. I will be timing myself when I get home! BTW he is 33 and has been throwing pots for a living since he was 16.The upper right shot is a plate that the over glaze painter did along with at least 2 other pieces today. Wow! what a day. The Bailey came yesterday and this morning before I left for the conference, I had the electrician wiring it up and Ilse, my assistant helping to unload and wax bisque out of the L&L. Never a dull moment on Beroth Circle! 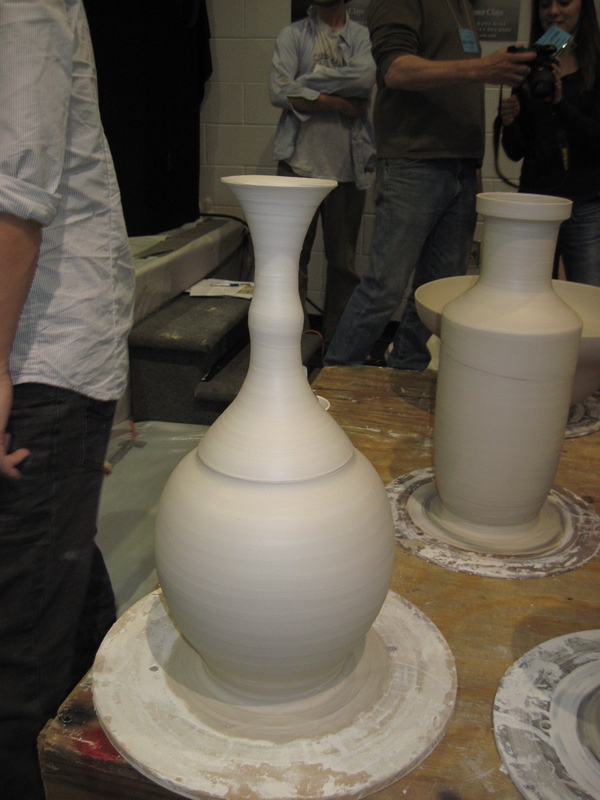 The Chinese pottery team was amazing, each doing a different step of the pottery making process. The thrower and trimmer were outstanding as were the under and over glazers. The two top images are finished pieces priced around $1280. The bottom pieces were thrown today and ranged between 12 and 50 lbs.